UK Accelerating Economic Boom, GDP 1.9% 2013, 4% 2014? Conservative Election Win? The latest ONS UK GDP data showed strong growth for Q4 that lifted annual GDP for 2013 to 1.9%, the fastest growth rate since 2007, and up from the 0.3% of 2012 and that many economists had convinced themselves that the UK was heading for a triple dip recession during 2013. The UK economy risks suffering from a triple-dip recession amid a period of persistently low growth that will last until the next election, the governor of the Bank of England Mervyn King warned - Nov 2012. Still despite the positive economic data, academic economists could be find right across the mainstream media focusing on the fact that more workers are working for less pay which is resulting in stagnating GDP per capita, this whilst missing the real big picture as revealed by Britain's latest unemployment data that far fewer workers were let go than during past recessions which has puzzled many journalists such as the BBC's former all things economics Stephanie Flanders, missing the obvious that firms having retained workers at lower productivity therefore have productive capacity primed to easily ramp up production without having to incur costs such as recruitment, higher wages and training, which as I expect will act as huge accelerant for the economy during 2014 and into the May 2015 general election. Stephanie Flanders - "Productivity, that puzzle, people worrying about why workers are not making more and why we are not able to make more per head is actually the flip side of living standards issue, because you can only pay workers more when they are making more"
Jeremy Paxman - "I asked Danny Alexander about this and he did not seem to know what the answer was either"
Stephanie Flanders - "No one does, officially we don't know"
The answer is productive capacity - Something the academic economists will only realise AFTER the FACT, well over a year from now, after the next election, after the Conservatives have won and so with the benefit of much hindsight they will be writing reams of worthless text explaining why the economic boom happened and that it was because of firms having a high degree of spare worker productive capacity that allowed firms to expand with little extra increase in costs as compared to past recoveries so that the expansion was not linear but exponential in terms of productivity gains. 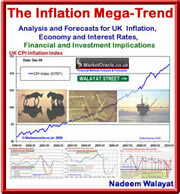 My long standing forecast as of Dec 2009 as illustrated in the Inflation Megatrend ebook (FREE DOWNLOAD), 31 Dec 2009 - UK Economy GDP Growth Forecast 2010 and 2011, The Stealth Election Boom ) and the update following the June Emergency Budget revising 2011 to +1.3% (09 Aug 2010 - UK Economy GDP Growth Forecast 2010 to 2015) was for the UK economy to grow by 1.4% for 2013 and 3.1% for 2014. Meanwhile academics will be busy once more revising their forecasts for 2014 as they ramp up expectations from a range of 2% to 2.5% to now a range of 2.5% to 3.2%, which will still significantly under estimate the actual rate that could even reach as high as 4%, a defacto election boom! Another thing that 99% of economists and thus journalists that regurgitate their views miss is the prospects for interest rates which will likely end 2014 far higher than anyone (apart from me) can imagine today as most such as Stephanie Flanders remain convinced they will stay put at 0.5%. Interest Rates to Rise Sooner than Anyone Expects? Therefore forget about 0.5% UK interest rates in 3 years time, far more probable is 4.5% interest rates by the end of NEXT year! Here is a re-cap of what the academic institutions expectations were for 2013 just prior to the start of the year in order of inaccuracy. Nov 2012 - OECD 0.9% and 1.6% in 2014. Nov 2012 - Bank of England : 1% - Stephanie Flanders again commented "The Bank hasn't just lowered its growth forecasts for the next year or so - it has more or less given up hope of being pleasantly surprised." At the end of the day, the bigger debt based boom we have the bigger the bust will be in 2015/2016. We have learned nothing. The cycle will run for more than a year or so, at least 4 years and even then its too far away to know when the next bust will be, my analysis suggests not for the remainder of this decade. We may look back on this moment as the start of a great boom that no one saw coming.